Discussion in 'Creative Archive' started by StellarWind Elsydeon, Jul 12, 2010. With the servers going boom and assorted other matters in my life, I haven't had the time to spawn a new art thread! So, instead of focusing on just sketches and almost exclusively on Pokeymans Stuff I figured I'll make a more general art thread for my stuff. Expect mostly sketches still, but on occasion other things will surface. However as it is 1 AM and my brain is pretty much in a state of beta decay at the moment I'm just going to leave you with this unholy hybrid of Looney Tunes and Pokeymans and shuffle off into sleep mode. Actual stuff to come soon. If you want to see my older stuff, the archive is there, and so is my dA gallery. Ha, that is an awesome combination of Zoroark and Willy E. Coyote, Stel. The texture of the fur looks very nice and the shading is quite gorgeous. The eyes are epicly hilarious and really capture the Loony Tune feel of it. The shadows on the sign look terrific as well. Wow, Stel, you've outdone yourself! That Wile E. Zoroark is amazing! Looking forward to your future works of art. My first Isshu-based character. All I know about him so far is that he's a gambler type, either married or formerly married, and that he has a badass otter. With a matching fedora. That flips an amulet coin around. Hey. I needed a badass otter too. I like your OC! There are too many damn kids in this fandom. Ok, that's gotta be a different Zoroark. There are multiple Zoroark, and I have better grammar and more courage than that wimp. Lolz at Wiley Zoroark. It's refreshing to see that 'mon as something other than Epic. I want an otter like that too. Gambler dude is cool. ♥'ing the fedoras. The Zoroark had summed up what was on my mind for months. As for your new OC, I think it looks awesome. It reminds me of a modern cowboy. The otter-Pokemon is very well drawn, too, even though you only had a leaked sketch as reference. Likin' the sketch. You should make an Avatar (the movie by James Cameron, not the T.V. show) based Pikachu. That would be something. Because controversial or not, Jynx is a frelling awesome mountain banshee thing and I felt like drawing one. Because my mind is weird as all hell. Because MORE SPIDER = BETTER THAN. Meet the newest addition to the Miato family - currently nameless and typeless, though the basic form is based on Argiope aurantia, the Black-and-Yellow Garden Spider, and the evolved form is based on a mix of it and Poecilotheria subfusca, the Ivory Ornamental Tarantula. Anyways, back to reviewing these fine new pieces of artwork... The first picture was actually quite a surprise to me - I wasn't expecting a 'Stel style' Jynx. I like the concept and the swirling symbols and lines look pretty nifty, too. But I just had to comment on those new Miato Pokemon - 'Cause I like me some spiders. The markings on the spiders seem to be a mix of several other markings from other spiders mixed into one which I like, and the second evo looks fantastic. Personally, I'd like to see some more from these interesting arachnids, and keep on taking the piss out of the Gen V Pokemon - that second piccu made me chuckle. I love Jynx in stel-style! Of all the pokemon that you could have done, I never expected Jynx as one you'd stellarfy! I lol'd at the second pic! What silly things those dressed-up Pokemon get up to . Spiders ♥ You can never go wrong with arachnids. Although now I am reminded of Spider Riders (which just recently finished airing here xD) Awesome design as always Stel. Gotta love the intricate patterns you incorporate in Pokemon. Jynx's robe there is also a lovely example of which. It really has become apparent that there are a lot of 'oddly dressed' Pokemon atm; Personally, I'm hoping Gochizeru gets a neater-looking evo, but ehhh. Hilarious piccu nonetheless. Oh goodness, I love seeing when your mind goes into a hilarious/strange state. Awesome stuffage like this comes out. I love the expression on Jynx's face. Oh the humanity Hilariousness! These arts are great! Especially the Jynx/Mountain Banshee. It is so good! 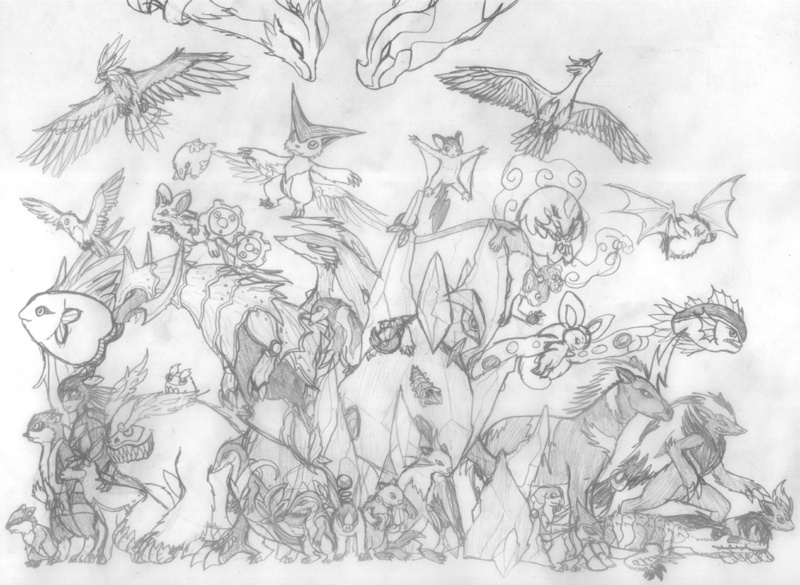 My favourite is the Zoroark. The spider is really well drawn, it looks like something you'd find in an information book. I didn't realise it was a pokemon until I read what was underneath the picture. I'm elated to see your artwork return Stel. I've got to agree with Linkachu, that winged mouse thing is really cute and kind of reminds me of a Digimon. Does THIS look like A WINGED MOUSE TO YOU?! Real art will come later, once I've calmed down. My inner caracal is offended. Yes. Digimon art style. That is exactly what I though when I saw this piece of artwork, and a lovely piece of artwork it is too, Stel. Lots of brilliant small details, and the way you've proportioned it really makes it look like a Rookie class Digimon - hell, this thing could pass off as a Digimon! Nice one Stel, keep on arting. I cannot believe people have called your anthro a flying mouse. It looks nothing like a mouse. It may have mammalian characteristics, but it is definitely not a mouse. I like the 'Sheesh' one in which it is sleeping. It's k-yut. The following image was so damn huge I deemed it had to be thumbnail'd. All known Gen 5 PokeMon so far, with the exception of Hatoboh (which I couldn't make sense of the blurry screenshot we have of it so far) and Desukan (that I couldn't figure out where to shove). This took way too damn long (drew this while taking breaks from studying to some exam from hell). Darumakka (I think that's the little blob thing) is seriously one of the cutest little critters ever. It pains me to admit that a 'squeed' when I saw him. I might have to have one now purely because of this drawing. I love that Shamama! It looks very zebra-like the way you draw it. Hmm..Very good poster! 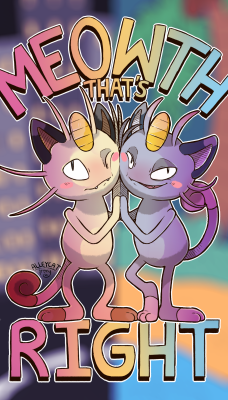 It's awsome because it has so many realistic things of what those pokemon would look like if they were real! One of the comments I've received in regards to my particular vision of Electabuzz is that they're far more slender and streamlined than the 'official' vision. My explanation for that mostly stems from the dual omnivorous/ergovorous nature of their diet. 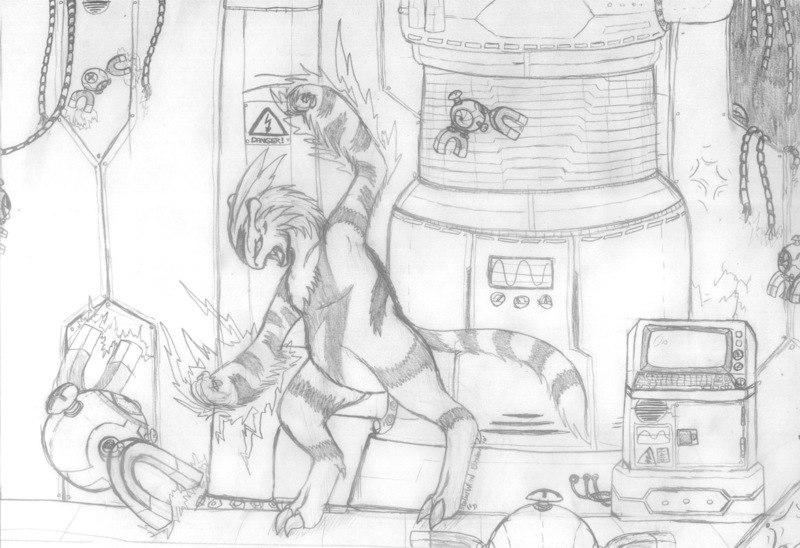 Electabuzz do require organic nutrients as a source for base materials, but another source of nourishment for them is derived from a form of electrochemical synthesis which they fuel through the absorption of electric charges. There is, however, such a thing as too much of a good thing. In the wild, Electabuzz get most of their massive 'power boosts' from atmospheric charges - predominantly, lightning storms - and most of the charge they acquire naturally dissipates over time due to use in communication or attacks. Human-made power sources made electricity far more available for groups of Electabuzz than it would normally be, in relatively continuous input as opposed to large, momentary bursts - leading to the creatures being drawn to these power sources and gorging themselves on electricity beyond the amount they would need to normally feed on, with much less activity required to get at it. So it's essentially become McDonald's for Electabuzz. It all went downhill from there. And all the 'buzzes you find in-game are found in the general areas of power plants. I think you can see where I'm going with this. I love how Zekrom and Reshiram are going all like haiizz ^^ Awesome picture in general, but these two legends just stood out for me. I've always loved 'Buzzes, even more than 'Vires. Fat angry 'Buzz is win. I love this action pose. The dramatic claw and expression...as well as the poochy tummy. Does the energy they store somehow become like lipids, storing themselves in cells? Dilofern the Sceptile, L. Jackson the Seviper, Darwin the Torkoal, Heavy the Hariyama and Tartarus the Crawdaunt. Seviper is what really caught my eye. I love the detail with the scales and tail, as well as being biased towards snakes. Crawdaunt is also very nice, looking more like a real lobster! Finally, an explanation for that star-thing. 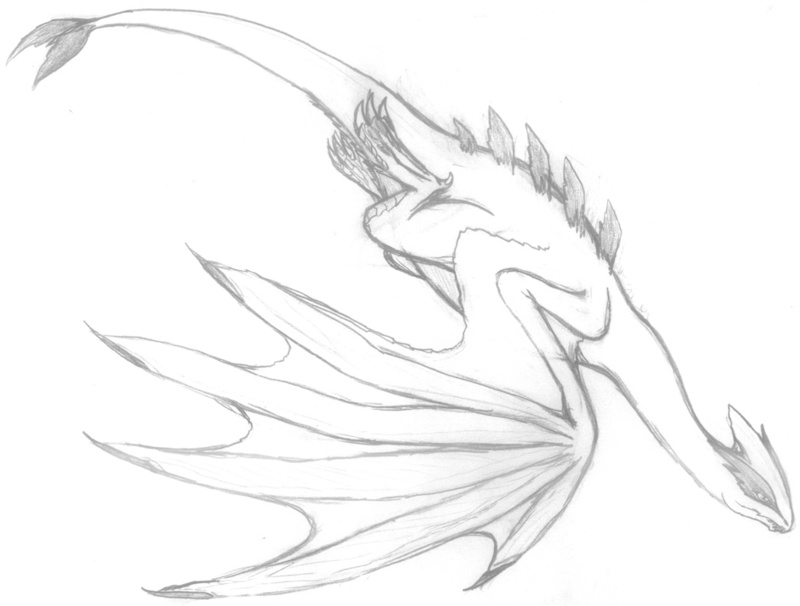 Drawn for an art exchange on an LJ community. Little is known about these powerful, deeply intelligent and majestic beasts of the sea: they are an exceptionally rare sighting beyond certain areas and even in those areas they only rarely appear near the surface. However, the partial data we do have suggests some fascinating possibilities. Lugia exhibit many conflicting traits - great muscle mass (allowing them to tirelessly fly or swim) alongside light yet extremely strong bones, capable of withstanding massive pressure. Their bodies are covered with a a thick layer of insulating, water-resistant plumage of a silvery color (these have come to carry some spiritual significance to certain island populations) and yet their wings aren't on the whole particularily avian - being more similar to chiropterid wings with very thick membranes or even to human hands, complete with one 'opposable' digit. These wings appear to serve as flippers underwater, allowing some very rapid propulsion through water as well as through air. 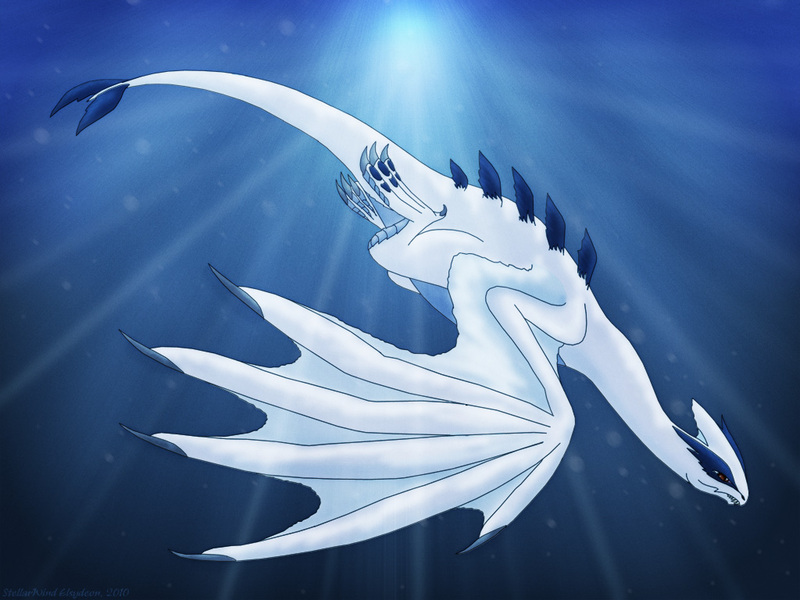 Lugia spend most of their time deep in underwater trenches. They seem to be adapted for deep dives, and it has been theorized that the adults at least have some form of limited underwater breathing capabilities. This makes them exceptionally difficult to observe, and as such we know very little about their diet (though we presume they are carnivorous due to their sharp teeth and the bony growths on the side of their 'beaks') or social structure (though we know they travel in pods in a manner similar to cetaceans when caring for young, who may be unable to dive for the longer periods of time the adults can). Telepathy may have a part to play in their communication, though they appear to primarily commune through intricate vocalizations similar to whalesong. Lugia vocalizations have been recorded before, though humanity is still far from decoding their intricacies. We do, however, know that Lugia have a large and highly developed brain - and they have been observed displaying psychic capabilities, including some form of localized weather control - on which they are said to have a balancing effect of sorts. That is not to say that such is always the case: Lugia are capable of causing massive storms by beating their wings - and legends say that one of the reasons to their underwater reclusiveness is their awareness of their own power, which may conflict with their legendary role as guardians of balance. Luuuuugiiiiiiaaaaaaaaaa. <333 /reserved spazzing. Could do so much worse. I love this drawing of Lugia (I don't think I've commented on this thread before, but I do enjoy all of it >>) but this just really stood out to me, I love the way that you added your own feel to the Pokemon, as you do with all your drawings, but this looks pretty awesome. I think the bit I liked most about this entry was the description of the species, particularly how they are 'wild animals' but their level of intelligence is significantly high. Choosing to dwell in isolation under water because of their abilities, and stuff like that. I really enjoyed that you made it a species as opposed to the 'there is only one because it's a legendary.' Awesome work, as usual!